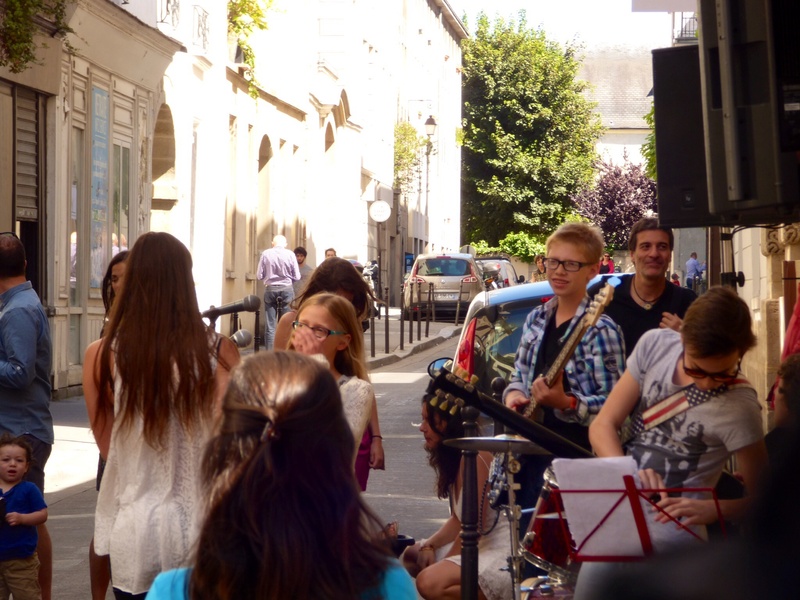 All over France, on the longest day of the year, there are musical celebrations everywhere as people take to the streets to have fun. In search of some good music, I took a stroll around part of the Marais and over towards the rear of Notre Dame Cathedral. If you’ve read the book “Corner of the Marais” you will understand the significance of the building on the right in the first two photos below. People were beginning to line the banks of the River Seine, and couples were continuing to deface the Pont de l’Archevêché in the name of romance. I made a trip past the corner restaurant where I spent my first Fette de la Music with a dear friend six years ago. Walking back to the apartment I met up with friends and listened to a super band playing soft rock and a little blues in the courtyard across the street. There was a fantastic male vocalist with piano, guitars and drums. From the apartment we had the best seats in the whole city. This entry was posted in Paris and tagged fettedelamusic, marais, paris. Bookmark the permalink. Remember that fette de la music very well and the couple dancing to big band type music right there in the street outside the restaurant window. And the woman’s spike heels! !